Daryn was going to dayhike Rockhouse from Big Meadow, and graciously let me talk him into a one-way hike that crossed the Kern River and came out at the head of Long Valley. Several years ago I had tried to do Rockhouse from the east, failed to cross the river in spring and noted there was a new (but open) gate high up on the road. This year we crossed the river on a freshly fallen tree and found the gate locked. But that's the end of the story. Here's a map of our entire route (the red line). Click on the image to get a popup that's easy to read because it's not scaled down - but it's very wide!! 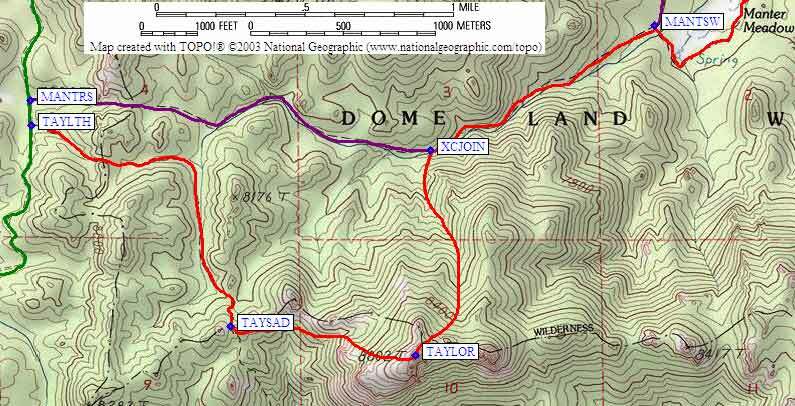 We used the almost-vanished Taylor Meadow trail (waypoint TAYLTH) to get to the saddle west of Taylor Dome (waypoint TAYSAD), then ignored the Jenkins directions and traversed the north side of the ridge to the base of the dome (waypoint TAYLOR). It's an easy Class 2-3 scramble, but with some exposure, up the crack behind Daryn in this photo (the west side of the dome). We went over the top and down the north side which is also Class 3 but feels less exposed. Rather than traverse west back to the trail we came in on, we headed north cross-country down to the Manter Meadow trail. This worked beautifully, aided by recent fires that cleared the brush, and we crossed remnants of a trail that's been abandoned for so many decades it's not even on the maps. Joining the trail near waypoint XCJOIN, we pushed through a few willows and were soon at Manter Meadow. The brush around Manter Meadow is growing back faster and has already obliterated the trail beneath stretching scratching branches... but the apparently good option of walking across the meadow wasn't so good. The grass was soaked with fall rainwater. Somewhere around Little Manter Mdw the trail gets vague, and it crosses to the south of Manter Creek briefly before returning to the north side, but the walking is easy and the brush is minimal. 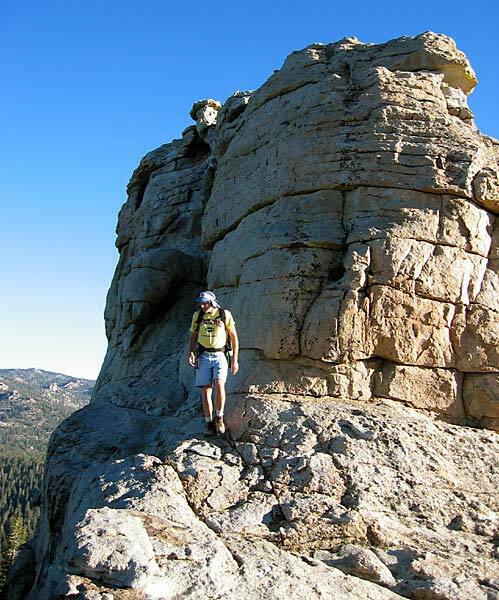 We went all the way to the trail saddle south of Rockhouse Peak (waypoint RCKSAD), then headed directly for the peak. We detoured slightly right around some larger rocks, but found that the burn had reduced brush to the point where you can go almost anywhere. The major defect on the east side is fun Class 3 climbing (splashed-rock handholds low, friction up high), and soon we were on Rockhouse Peak. We had a report that the register was missing, but there was a cannister and book on top. The cannister lid was bent and didn't fit over the cannister - we guessed it had survived a fall off the summit and someone had brought it back up. Could the so-called "register thieves" actually just be clumsy people dropping them? Who knows. I spent most of my time on the summit banging the lid back to almost round with a rock, then reaming the inside of the lid so it goes mostly back on. If anyone else is headed that way, take a metal file to finish the job! We swung further to the east on our return back to the saddle, to stay in sandy footing. It all goes now! There is effectively no trail at all east of the saddle (dropping down to the South Fork of the Kern). We stayed right (south) of the drainage most of the time, but sometimes dropped right into it. If you're really alert you can catch parts of the old trail. It's very steep but it's well worth looking for. There are places where it traverses side gullies and if you went too low you'd get caught in brushy waterfalls. When in doubt, stay high. As the terrain levelled out, there was no longer any sign of the trail. We headed for my waypoint KRNRIV, where the map shows an old crossing. There was no river visible, and we wondered if we were even in the right valley - but there are rocky outcroppings on both sides of the crossing and we ended up right where we should be. To our surprise and delight, there's a freshly-fallen tree across the river! No wading! It looked higher than past reports indicate it should be in late September (several feet), but could have been waded without much risk. Once on the west side of the river, go uphill to the northeast and catch the old 4WD road shown on my popup route map. It's gated 2.5 miles and 1300' above you, as described on the Canebrake Road driving directions page, so fill those water bottles and get moving! Don't be fooled by the Domelands Wilderness gate where the old Jenkins directions say you should park - go right through that one and stay on the old dirt road until you hit the gate you can drive to. We got to the car (waypoint LNGRCK) about half an hour before sunset, having spent almost 12 hours walking 17+ miles and bagging two Domelands peaks. 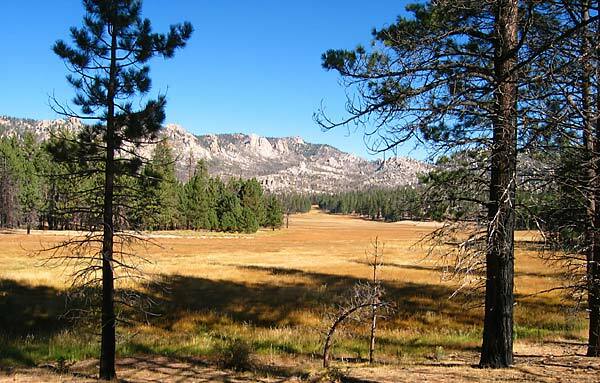 The one-way elevation gain is the same as the round-trip gain from Big Meadow, just under 4000'.